As you may have noticed Sirius took a nose dive in the last 10 minutes of trading Friday, closing down over 20%. The 10 day average volume for Sirius is 67.5 million shares, however on Friday the stock traded over 432 million shares (including after hours). With roughly 100 million shares traded at 3 PM, Sirius volume exploded in the final hour, especially in the final 10 minutes and into after hours. This is most likely due to Sirius being deleted from the Russell Index. So much money is invested in index mutual funds that adding or deleting a stock from a widely followed index has a huge impact on its price. A stock that is added to an index, for example, will automatically be purchased by all funds benchmarked to that index, propelling its stock higher. Conversely, a stock that is deleted will automatically be sold, forcing its price downward. Note carefully, however, that these big price swings have nothing to do with the stocks' fundamentals. So issues that have been added to an index will presumably become overvalued relative to stocks that have been deleted. In after hours, Sirius traded as high as 48 cents but finished trade up 6 cents (16.67%) to 42 cents. The current bid ask spread is .415/.42. Sirius had a nice move up Thursday on the news of a strong debt sale, so it will be interesting to see if Sirius can hold this after hours gain into Monday. I am lucky I didn't have any stop loss orders in for Sirius as I would have sold at the wrong time. To get an entire list of stocks added and deleted from the Russell Index on June 26, 2009 Check out my blog post Russell Reconstitution Stocks Added and Deleted from the Index. Today was the the Russell Reconstitution where stocks are added and deleted from the index. I thought it would be worth noting which stocks were added and deleted from the Russell 3000 index today. The list below is taken directly from the Russell website. As stated on April 27 of this year in my blog post U.S. Futures Looking Dismal but Possible Swine Flu Profit Play, I gave you a look at how the media plays a role in helping stocks performance over a period of time. Since then the H1N1 Flu (Swine Flu) has been declared a pandemic. Although I don't expect the media to be reporting about the Swine Flu too much over the next week or two, unless something drastic happens (due to other stories that have crept up recently), this is still an issue we have to deal with, and don't think drug companies have stopped the R&D process on finding another pill. I was doing my nightly research and I noticed an unbelievable amount of stocks from the healthcare sector (Biotech and Drugs) which have been strong the last 30 days (Swine Flu has been a popular topic in the media over the past 30 days, but note that all of the companies in this article are not trying to develop a vaccine for the Swine Flu, but are in the healthcare sector), and are still demonstrating strength on the technical level. The ratio used in evaluating these stocks is called the Bull:Bear ratio, which is defined on my blog post Bull Bear Ratio Defined. I don't like using just one piece of software so I go to another source which is Investor's Business Daily (IBD) as they give a very nice composite rating for these stocks. 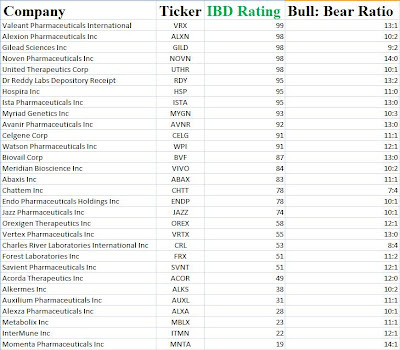 For details on how IBD ranks these stocks check out my blog post One of My Methods to Finding Bullish Stocks. From the list above the stocks I like the most and believe have a good chance of being winners in the near future are Valeant (VRX), Noven Pharamaceuticals (NOVN), and Ista Pharmaceuticals (ISTA). Strategy #1: Valeant showed up in this list and was a stock I've been bullish on since April 27 as you can see from my blog post linked to in the first paragraph. I think this stock has some upside left and I am going to be more aggressive and speculate by being the buyer of call options on this stock. I am currently looking at the September 25 Calls which can be purchased for less than 10% the cost of the stock price at close, therefore a 10% move up in the stock will give me my money back and a return. Not to mention this stock is trading above 26 which puts this call option already in the money by $1.18 a share. This stock has nearly doubled since I first blogged about it, and it could go down just as fast. This is the reason I may be purchasing calls in the money versus the common shares of this stock. To learn more about trading options check out my E-Books. Strategy #2: I was thinking of using the buy/write option strategy for this stock, however If I purchased the stock I am afraid I would not be able to write out any options on it, as the options on this stock are almost illiquid. For this I would use the simplest strategy of all, and buy common shares. I would look to get in on weakness though, such as a 7%-10% pull back. Once I hold the stock I will monitor the options market to see if a decent premium can be made on heavier (more liquid) options volume. Strategy #3: ISTA more than doubled since my blog post on April 27, but is still strong in both of my ratings obtained. The stock made a new 52 week high June 25, 2009 at 4.40 before closing at $4.19 a share. This stock looks like it wants to continue the breakout, and could very well do so. I am looking to accumulate common shares of this stock, as options are not issued on this stock. Again I will look to purchase shares on weakness, such as a 7%-10%. 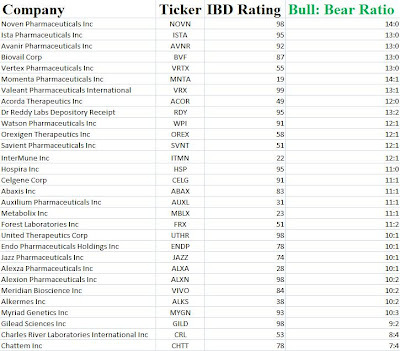 For your convenience, I have put together a printable list of the 30 stocks in the table ranked by Bull: Bear Ratio as well as by IBD score.